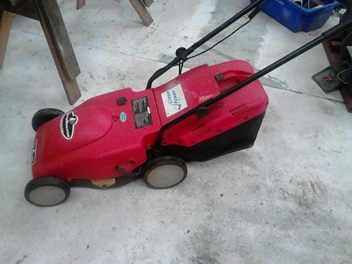 Just bought a pair of second hand Enviromowers for $130 on TradeMe yesterday (they sell for about $550 new). The seller said one came from a garage sale but was dead - he was thinking of using it for parts. They came with 3 battery packs and 3 grass catchers. Once I got them home I got one mower working with one battery. I left it to charge overnight. Today I mowed the lawn. It worked perfectly. The battery still had plenty of juice in it after finishing. So I was pretty happy with that. Then I turned my attention to the two "dead" battery packs. One measured plenty of voltage but wouldn't work when slotted into the good mower. It turns out it just had a loose connector and works fine now. The other battery had some fractures around the outer casing - so it's been dropped at some point. It was measuring 0 volts at the output. Once I opened it up I noticed it was missing the jumper connector that links the two 12V 10AHr Sealed Lead Acid internal batteries. The batteries measured 7V and 9V - so they're well past there prime. I replaced them with two 12V 7AHr SLA batteries I had. Now that battery pack works fine too. It'll be interesting to see if the lower capacity is still enough to mower our whole lawn. One thing I'd like to do it put a permanent little voltmeter on the mower (or battery) so I can see what's going on a bit better. There's currently only a single green LED on the mower to show power state. When I put a good battery into the "dead" mower it started up fine. At some point I'll probably flick the better looking mower back onto TradeMe and hopefully recover some of the cost of buying the two. Since it's a 24V system I'll be able to use the 24V Lithium pack I've got that is currently being used in my e-scooter. The standard Enviromower battery pack weighs about 7kg whereas my Lithium pack is about 3kg.